The front of the Karat 6.3 comes off quite easily. First the 2 screws in the aperture ring are removed along with the ring itself. Then the focus ring and washer are removed. Having then taken out the 2 screws at the 2 edges of the front panel, the whole panel lifts away showing this view. In this photo the 3 screws holding on the front of the shutter housing have also been removed so we can get into the actual works. Having removed the 3 screws in the shutter front - the whole front assembly just lifts off. The diaphragm and lens element are integral to this and do NOT have to be separately removed. 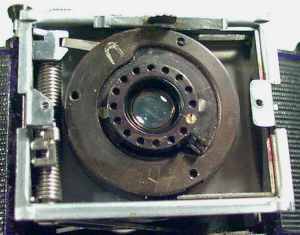 With other shutters, like the Synchro Compur it is usual to remove all front lens elements separately before the front of the shutter become accessible. On the other hand the diaphragm on the Synchro Compur is usually behind the shutter blades and doesn't need removing to get this far. Not much inside though! Compared to the Synchro Compur this shutter is much simpler with lots of empty space. Its a readyset or everset design so there is no cocking before firing. The actual act of pushing the shutter release both sets and releases this shutter. This is about as far as I got though! When I first opened up the shutter I thought the shutter blades were missing as there were no sign of them. However after some careful examination - there are 2 very thin, very dark shutter blades forming a simple 2 bladed shutter present. 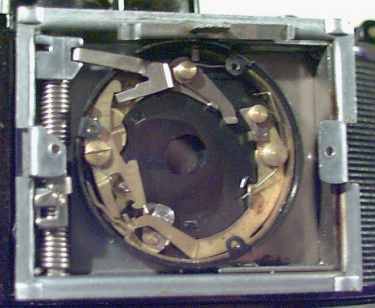 However activating the shutter mechanism doesn't seem to make the blades move. In fact the lever (silver one at the 7 o'clock position) which does move the blades seems curiously disconnected from the rest of it. 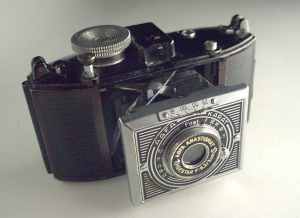 We have been kindly sent some more info on this camera - click HERE to read it - though as yet I’ve not had a chance to work any further on this camera.